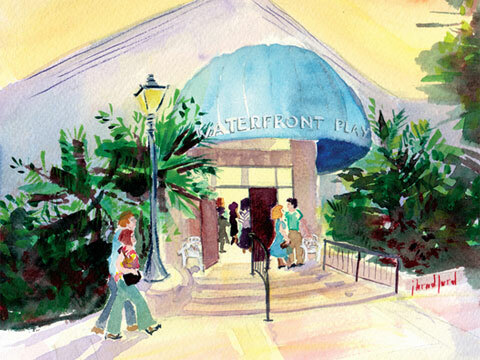 The Waterfront Playhouse is a not-for-profit, professional theater located on historic Mallory Square in Old Town Key West. We are an intimate 150-seat theater that attracts locals and tourists alike with a wide range of comedies, dramas, musicals, classics, concerts and children's productions, as well as world premieres. Recent hit productions have included Reefer Madness, Urinetown, Gore Vidal's The Best Man, Equus, Tuesdays With Morrie, Educating Rita, Naked Boys Singing, Dinner With Friends, the world premiere of Carl Hiaasen's Lucky You, as well as many others. The Playhouse utilizes Key West's rich talent pool of actors, directors and designers, as well as attracting internationally known luminaries including Kelly McGillis, Donna McKechnie, Charles Busch, Terrence McNally, Israel Horowitz and Carl Hiaasen. Go to www.waterfrontplayhouse.org to see our current production schedule, to find more information or to book tickets on our internet ticketing service. Or call our box office at 305-294-5015. Join us for an exciting evening of live, professional theater in Paradise.